I'm working on an analytical dashboard to help an owner of a restaurant chain to analyse performances of his restaurants. Restaurants could be filtered in groups, depending on places (ie "Show me all the restaurants in that city."). 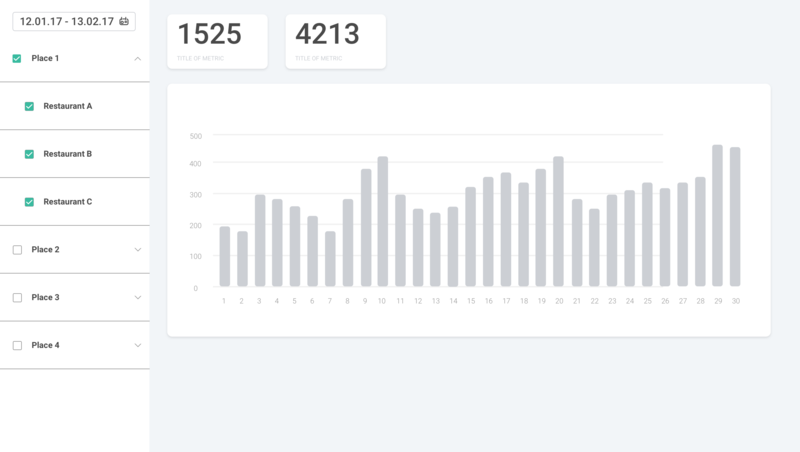 I'm now thinking about a sidebar with a simple filter: a list of places with a checkbox to let user compare metrics about selected areas: therefore user can look at some graphs about transactions or revenues. What if user want to analyse performances of just one restaurant? Can you suggest me an alternative to a dropdown list with a checkbox for each restaurant, as shown in the image? Instead of accordion I would use classic tree view for filtering, and would enchance it with search on top. The best advice I can give to you is to gain a thorough understanding of the problem you are trying to solve. Ask yourself as much questions as possible and try to find satisfying answers. What is the kind of data you are visualising? What attributes does the data have? Which relations in the data are important? What kind of insights does the user want from the data? There are many more possible questions. Try to really understand the problem before spending too much time on specific solutions or design decisions. You seem to have settled on a bar chart now, but another type of chart could be more appropriate. Maybe a bubble map chart or a bar chart on a map. I have no idea at this point, but you will find out soon enough once you research the problem. I know a pretty generic answer, I cannot be more specific without knowing more about the problem. Not the answer you're looking for? Browse other questions tagged usability navigation lists filtering dropdown or ask your own question. Alternative for dashboard without sidebar?